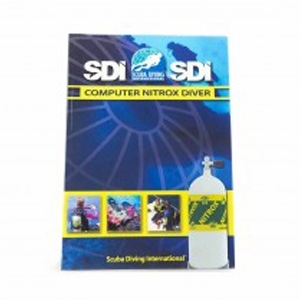 THE SDI COMPUTER NITROX MANUAL IS A TEXT-BOOK LITERARY ASSISTANT TO THE SDI COMPUTER NITROX CERTIFICATION COURSE. By signing up for this course, the perspective student can extend their diving experience by enjoying longer bottom times than their air-diving buddies. When used correctly, nitrox lessens a diver's risk of decompression sickness compared to doing a similar dive on air. Programmable Nitrox dive computer have greatly simplified the process of planning and tracking essential additional concerns of Nitrox diving. In-depth chapter information and technique includes (but is not limited to); description of Nitrox, how Nitrox is used, the risks associated with Nitrox use, selection of equipment, how to fill cylinders with Nitrox, and finally planning a successful Nitrox dive. Using the Computer Nitrox Manual as a reference, students may utilize the Knowledge Quest Work Booklet by answering the provided questions with the most appropriate and accurate answers.